Long-term change in contamination, eutrophication and acidification indicators has been reported from the North Sea and adjoining coastal waters during the last decades. Although corresponding data have been extensively collected during numerous campaigns at sea, no quality-checked, intercalibrated and integrated data sets with sufficient temporal and spatial resolution exist for these parameters for the Belgian Continental Shelf (BCS). This seriously hampers evaluating long-term environmental change in this heterogeneous and complex area, where various factors and processes, operating at different spatial and temporal scales, impact marine ecosystem status and health. Designing and implementing Integrated Coastal Zone Management actions in the BCS requires a thorough and correct understanding of environmental change in the area, and this in turn needs robust historic (and future) long-term data sets. In the BCS, modern oceanography, with systematic campaigns for assessing the quality of the marine environment, started with the “Projet Mer/Projekt Zee” (PMPZ) in 1970. Within this first phase of the Belgian Federal North Sea Research Programme, all compartments of the marine ecosystem were studied. This initial program was followed by other research actions, programs and monitoring campaigns, resulting in a large set of valuable historic data on the marine environment of the BCS. The use of these data however suffers from two major drawbacks. First, many historic data are still only available on paper, scattered across different Belgian institutions. Second, many of these programs were carried out more or less independently from one another. The lack of coordination, continuity and integration resulted in inconsistencies in spatial sampling coverage and resolution, sampling frequency, data storage, and changes in measurement techniques and conditions. In addition, methodological changes were also implemented because of technological advances [e.g. the routine adoption of High Performance Liquid Chromatography (HPLC) methods in phytoplankton pigment oceanography since the late 1980’s] and new opportunities (e.g. the use of remote sensing (RS) for phytoplankton and turbidity monitoring since the mid-1990’s). Assembling data from different time periods, often obtained with different spatial coverage and resolution, and with different methods is typically a source of error that must be estimated and corrected. The 4DEMON project was therefore designed to build quality-checked, intercalibrated and integrated data sets on the marine environment in the BCS, and use this data for assessing environmental change in this area. The overall coordination (WP1) and timing of the project is trusted to RBINS, OD Nature, and involves a.o. the organization of meetings, the technical workshops, and reporting. 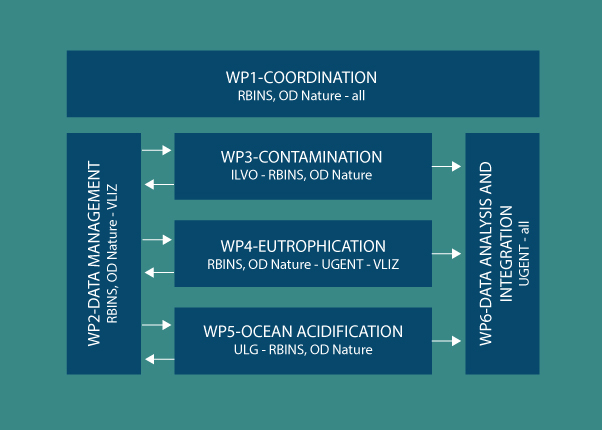 Three work packages (WP3-5) are devoted to the actual development of the integrated and intercalibrated data sets for respectively contamination, eutrophication and ocean acidification. Data managers (WP2) will coordinate and support these three work packages by offering common and central tools to the partners, from data inventory to database and data dissemination. At the end of the project, all information is used in integrated statistical analyses (WP6), analyzing and comparing the established time series and comparing with trends in adjoining coastal areas. Data on contaminants (MSFD Descriptor 8, 2008/56/EC) in the BCS have been measured since 1970 with the start of the PMPZ project, followed by the CRA (Concerted Research Actions) Oceanology. Since 1978, the monitoring of contaminants became systematic due to the national obligations as contracting party of OSPAR. Today, the OSPAR Coordinated Environmental Monitoring Programme (CEMP) obliges the monitoring of heavy metals (Cd, Hg, Pb), PCBs, polycyclic aromatic hydrocarbons (PAHs), tri-butyl-tin (TBT), hexachlorocyclodecane (HBCD) and polybrominated diphenylethers (PBDEs) in marine biota and sediments. Monitoring of the above mentioned persistent organic compounds within OSPAR is systematically performed by MUMM and ILVO (heavy metal analyses are outsourced to CODA-CERVA). Depending on the compound, time series on historical data may go back up to four decades. Priority will be given to compounds with the longest time series, i.e. PCBs and heavy metals in sediments and biota. Quality-controlled and intercalibrated contaminant data sets for different compounds or groups of compounds, for the sediment and biota matrix and for different sampling points or sampling zones will be constructed. Dissolved nutrient concentrations and ratios, phytoplankton biomass and species composition, and turbidity are key indicators to monitor the status of eutrophication in coastal waters (MSFD Descriptor 5, 2008/56/EC). These indicators are influenced by natural and anthropogenic processes acting at different temporal and spatial scales. To assess the relative impact of these processes, robust long-term data series are essential. The objectives are to inventory, recover, intercalibrate and compile four decades of nutrient, turbidity and phytoplankton biomass and species composition data from the BCS and to integrate more recent remote sensing (1997-present) and underway fluorescence phytoplankton biomass data (mid 80’s-present), which offer much higher spatial resolution. In addition, parallel data sets will be compiled on zooplankton. Historical reconstructions with a model suggested that in the Southern North Sea the increase of primary production related to eutrophication would have countered the effect of ocean acidification on carbonate chemistry until the late 1980’s when nutrient emission reduction measures lead to a decrease in phosphate concentrations and a decline in primary production. Yet, these findings were not validated by field data. Ocean acidification can alter the rates and fates of primary production and calcification of numerous marine organisms and communities. Such changes can change the ocean’s carbon sequestration capacity, biodiversity and ecosystem services and goods. The detection of the underlying complex interactions require long time series of quality checked variables related to carbonate chemistry such as pH.